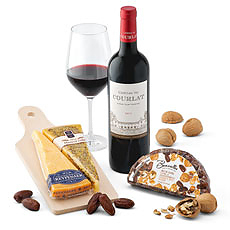 Our gourmet cheese gift baskets for delivery in Germany can be combined with wine, biscuits and chocolates. 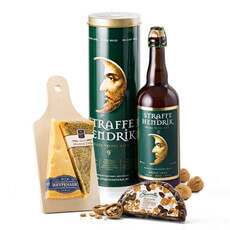 Cheese gifts are delivered next day to Germany and can be sent as a Christmas gift. Delivery of cheese gift hampers with the finest French, Italian and Dutch cheeses accompanied by Europe's favourite wine, fruit or champagne. A delicious gourmet experience is a perfect gift for anyone in Germany. Our selection represents the world's finest Dutch and French cheeses, beautiful accessories and irresistible accompaniments. All packed together in one big cheese gift basket. Cheese and wine fit perfectly together, especially red wine goes well with the selection of the best cheeses that we have for our gift hampers. 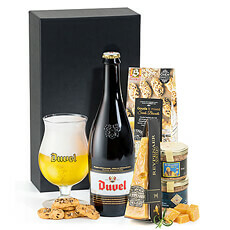 We have been sending gifts with wine and other alcoholic drinks since 1998, so we know how to get this type of gifts delivered with the recipient in Germany. If you want to give your gourmet gift an original touch, you can go for one of our cheese gift baskets with salami and other specialty meat products from Italy and elsewhere in Europe. Some of our wine and cheese gift baskets also contain other gourmet treats such as crackers and salty biscuits, and we have hampers that combine cheese and fresh fruit as well. 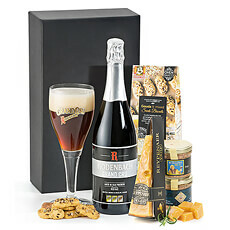 Our cheese and wine hampers are simply perfect as a Christmas gift for delivery in Germany. Using our international gift delivery services, you can send your cheese gift to any destination in Germany and elsewhere in Europe on the day that you select, along with a personal gift card. Our cheese gifts always come in a nice gift basket and are packed safely so that your present arrives in great condition. We can also deliver these gifts to businesses, making this a great corporate Christmas gift.